Is there cause for concern in the Huskies' secondary? Can Hunter Bryant be a real factor in the final two regular-season games? That and more in a review of UW's victory over Stanford. Myles Gaskin reaffirmed his status as the most valuable player the Huskies have Saturday night. An apparent shoulder injury had kept the senior running back sidelined the past two-plus games, the first games he’d missed in his collegiate career. Gaskin was initially injured at UCLA, then a week later he re-injured the shoulder early on in the loss at Oregon. He did not play in the 12-10 loss at Cal, when the Huskies were held to a season-low 91 yards rushing and the offense had one of its worst showings of the Chris Petersen era. Against Stanford, Gaskin returned for his penultimate game at Husky Stadium and carried the ball 28 times for 148 yards and one touchdown — one of the greatest performances of his record-setting career for the Huskies, all things considered. The Huskies had to have this game to stay in the Pac-12 title race, and they had to have a performance like this from Gaskin to do just that. “Unbelievable,” Jake Browning said of Gaskin’s night. “Myles is someone I’ll be close with for the rest of my life. You name it, we’ve probably been through it tighter,” Browning added. “We’ve been booed; we’ve probably both been benched. There’s a lot of trust there. I would trust that guy with my life, and I trust him even more handing the ball off.” Gaskin was clearly still in some pain in the second half, and this bye week comes at a good time for him. Is there cause for concern in the secondary? 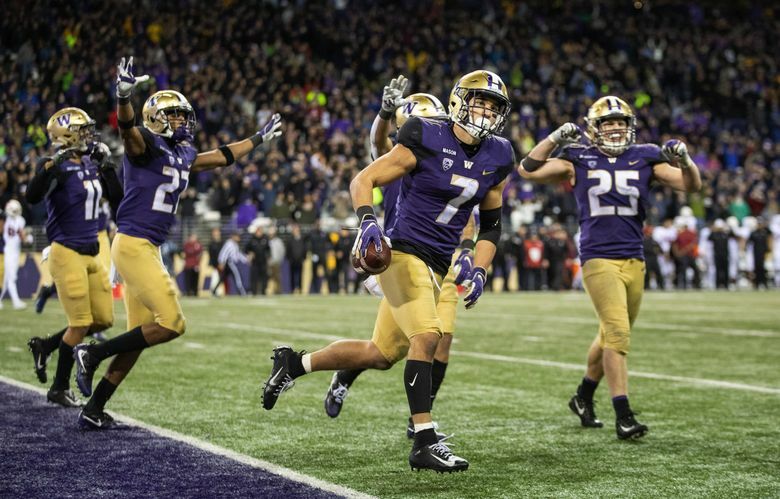 There were many positives to take away from the Huskies’ defensive performance — Byron Murphy had his first interception, and Taylor Rapp made the game-saving interception on the game’s final play in the end zone — and especially so considering the secondary was without two senior starters for much of the game. (Jordan Miller missed his second straight game with an apparent leg injury, and JoJo McIntosh was ejected for targeting early in the second quarter). For most of the game, UW’s secondary featured three second-year sophomores in Elijah Molden (nickelback), Keith Taylor (right corner) and Brandon McKinney (strong safety). They held up reasonably well considering the mountain-sized task of defending Stanford’s passing attack. Stanford’s 6-foot-5 tight end, Kaden Smith, was targeted eight times and had eight catches for 107 yards and a touchdown. K.J. Costello completed 29-of-43 passes for 347 yards and excelled in the second half even without star receiver J.J. Arcega-Whiteside, who exited in the second quarter with an apparent ankle injury. Look, no one here is sounding the alarm bells regarding the play of UW’s secondary. But if Stanford — Stanford! — is able to move the ball that well through the air, one can’t help but wonder what Washington State might be able to do when it throw the ball 70 times against this defense in a couple weeks. Can Hunter Bryant be a real factor?